Sun Peeking, 6×9″ pastel painting of the morning sun through the trees during a winter walk by Marie Marfia ©2019. This painting is available on ebay. Click the link below for more info. I love walking in the woods on a winter morning, especially just as the sun is coming through the trees. The sky is all kinds of peach colored and the light looks like stained glass to me. Beautiful! This entry was posted in A pastel a day, Daily painting, ebay sales, forest, Landscape, Manistee National Forest, painting a day, Pastels, Woods scape and tagged art for sale, ebay listing, forest, manistee national forest, morning, pastel painting, sky, snow, sun, winter, woods on February 12, 2019 by Marie Marfia. You can’t see it, but my car is parked just up ahead. 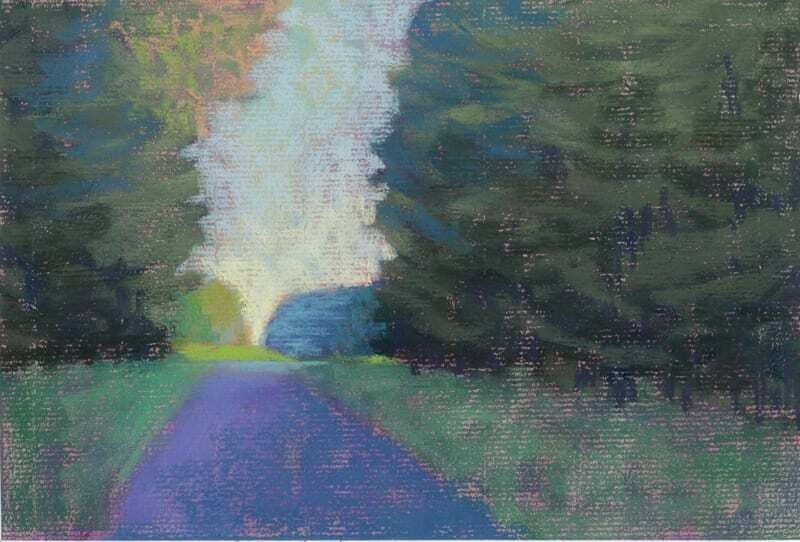 This entry was posted in A pastel a day, forest, Landscape, Manistee National Forest, painting a day, Pastels, path, road, trees, Woods scape and tagged art, forest, landscape, Marie Marfia, painting, pastel, road, sky, trees on October 1, 2018 by Marie Marfia. Today I brought my mother-in-law to my gallery. I was going to take her to the Ludington Area Center for the Arts to look at an art show there but she said, “Are your paintings there?” and I said, no, they weren’t. “I want to look at your paintings,” she said. So we ended up going to my studio. I brought her in, helped her sit in one of my cafe chairs and she watched me paint a larger version of the painting above. Afterward, I tried to get her to help me fill out a questionnaire from the American Cancer Society (she had lung cancer a number of years ago and the ACS sends out these forms for research purposes), but she was more interested in telling me what had happened to her this morning. She doesn’t care for it when the aides come into her room and act as though she’s not there, talking among themselves and not including her. It’s de-humanizing. Makes you feel like a worthless lump. Diana can talk pretty well still and she understands a lot of what’s going on around her. If she feels pressure to perform she stumbles when searching for the words she wants. But she’s definitely all in there. I get how it can be a lot easier to talk to someone who you work with every day than some poor old woman that you don’t know very well. But no one likes to be treated like a dummy. Especially not Diana. I’ll definitely do my best to make it so. This entry was posted in A pastel a day, Landscape, painting a day, Pastels, seascape and tagged Alzheimer's, Alzheimer's Disease, beach, beach art, beach grass, cottage art, cottage decor, dementia, dune, dune grass, grass, lake, Lake Michigan, sand, seascape, sky, water on March 1, 2018 by Marie Marfia. I like how the shadows carve out the snow. Or is it vice versa? I like it, anyway. So I’m finding that having a clear horizon is important to me right now. That’s why I’m putting the lake out there. Cool, blue and attainable. I just have to get over these dunes first. This entry was posted in A pastel a day, Landscape, painting a day, Pastels, seascape and tagged beach, beach art, beach grass, clouds, cottage art, dune grass, dunes, grass, Lake Michigan, pastel painting, sand, sky, snow, water on February 24, 2018 by Marie Marfia. This version is with a warm blue underpainting and pink and purple shadows. There are dunes between me and the water, but I can see it from here. I know I’ll get there. This entry was posted in A pastel a day, Landscape, painting a day, Pastels, seascape and tagged a painting a day, beach, beach art, clouds, cottage art, daily painter, dune grass, dunes, horizon, Lake Michigan, pastel, pastel painting, sand dunes, sky, snow, water on February 22, 2018 by Marie Marfia. Had a very nice weekend with friends up in Leelanau County. It sure is pretty up there. Steve took some pictures of the lakeshore. We were hiking around on Lake Michigan, looking for ice caves. Saw a few but I generally stay away from the edge of the ice. I have a fear of being trapped under ice. When Steve used to take the kids out to look at ice caves I would stay home and worry. It was easier than going along and worrying. Anyway, we hiked around and played some games and celebrated an old friend’s birthday. This is her last year as a fifty-something. Hope it’s a fabulous one. I’m going to try to step up my daily painting game in anticipation of our vacation coming up at the end of March. I’d like to have enough daily paintings to keep seven at auction the whole time I’m away. We’ll see. If I go back to my old practice of two a day, I should have plenty stockpiled by the time we leave on March 18. This entry was posted in A pastel a day, Landscape, painting a day, Pastels, seascape and tagged beach art, clouds, cottage art, daily painter, dune grass, dunes, love Ludington, Ludington, ludington state park, Michigan, painting a day, pastel, pastels, sand dunes, sky on February 20, 2018 by Marie Marfia. That interview I did with Mason County Press was a lot more fun than I thought it would be. I have a tendency to worry about things like that. I anticipate all kinds of weird things going wrong and have to work pretty hard to calm myself down beforehand. I suspect a lot of people are just like me, nervous of looking foolish in front of everyone. And to be honest, I didn’t realize I was quite so Midwestern sounding until I heard myself speaking. Kind of hoot, really. I’ve been getting a lot of good feedback from friends, and even met some new people who saw the interview and stopped by the studio to say hello. This entry was posted in A pastel a day, Landscape, painting a day, Pastels, seascape and tagged beach art, beach grass, clouds, cottage art, dune grass, dunes, Lake Michigan, ludington state park, sand, sand dune, sky, snow on February 19, 2018 by Marie Marfia. Finally heard from my youngest after what felt like years but was probably only a month and a half. He’s been struggling to find work for almost a year. I had high hopes that this month he’d found something because we hadn’t yet got word that he needed rent money. Now I’m thinking we ought to reconsider whether or not to send it. I am of two minds about this. I want to continue to provide for him because I’m his mother, it’s what I’ve done for twenty plus years. But I want him to stand on his own two feet. I can’t continue to be his safety net because as long as I do that he can’t call himself independent. The pros to cutting him off: He lives in Florida, so if he has to live in his car, he won’t freeze to death. He’s got friends who will let him couch surf if he has to. He’s smart and resourceful, he can solve his own problems. The cons: I feel like I’m throwing my baby out of a moving car. If he does end up on the street and something terrible happens I’ll never forgive myself. If he reneges on his lease, our name is still on it and they’ll come after us. But you know what? there are all sorts of things that I already can’t forgive myself for, so really, what’s one more thing? And while it feels really crummy to cut him off on Valentine’s Day, any other day will feel just as bad. Probably. Sigh. Children. I love them but it’s so hard to do the right thing. I suppose if it was easy, everyone would be doing it. This entry was posted in A pastel a day, Landscape, painting a day, Pastels, seascape and tagged beach, beach art, clouds, cottage art, cottage decor, dune grass, dunes, Lake Michigan, love Ludington, Ludington, ludington state park, Michigan, painting a day, pastel, pastel painting, sky, small art, snow, water on February 14, 2018 by Marie Marfia. She Texts! 6×9″ pastel on sanded paper. ©2018 Marie Marfia. It might not seem like much to you, but it means everything to me. My daughter texted today. You know how it goes. Your kids are grown. You don’t want to be a pushy mother. You wait for them to call you, to let you in on their lives. Sometimes you’re lucky and you get a whole phone call to yourself. It’s weird. I know it’s weird. I remind myself that back in my parents’ day, they were lucky to get a postcard twice a year from their kids and that includes me. And I tell myself all the time that if they needed me for anything they’d let me know. That no news is good news. But I’m a hover mom, I admit it. Even now, when they’re all in their twenties, I want to know what they’re doing every minute of the day. It’s probably got something to do with menopause mind. I didn’t used to be so needy. I think my body chemistry, including my brain chemistry, is all kitty whompus. It’s not me, it’s my hormones! But those are just as much me as anything else. I guess I don’t have an excuse when you get right down to it. But I have a cure! See this painting? See those trees? How excited they are? Those are me! Those shivering, shimmering branches on the top of the very highest dune in the park. It’s by way of being a very good day. This entry was posted in A pastel a day, Landscape, painting a day, Pastels, seascape and tagged cottage art, cottage decor, daily painter, daughter, dune grass, dunes, hormones, hover mom, lakescape, landscape, love Ludington, Ludington, Ludington Michigan, ludington state park, menopause mind, painting a day, pastel, pastel painting, sand dune, sky, small art, snow, texts, trees, winter on February 13, 2018 by Marie Marfia. No House of Flavors Today, 6×9″ pastel on sanded paper. ©2018 Marie Marfia. My mother-in-law had a doctor’s appointment today and Steve and I planned to take her out to House of Flavors restaurant afterward for lunch. But the staff at Ludington Woods called and said they were quarantining the residents because there was a flu outbreak there. So we’re not going after all. Steve’s going to stop in to see her if they’ll let him. I brought a lunch. At least she probably doesn’t remember that we were going to take her out today. That’s the curse and the blessing of losing your memory, I guess. And of course, it’s more important that she stay healthy. Still. Ice cream would have been nice. I think this painting looks like a couple of scoops of ice cream with some sort of sauce on top. Yum! Except it’s kind of hairy looking with all the dune grass. Ew. This entry was posted in A pastel a day, painting a day, Pastels, seascape and tagged art for sale, cottage art, cottage decor, dune grass, dunes, Lake Michigan, Ludington Michigan, Michigan, painting, pastel, sand dunes, sky, small art, snow, water, winter on February 12, 2018 by Marie Marfia.